How property managers and service providers win with technology. Ask yourself this one question; if my customer fired me today, would they lose something unique that my competitor could not give them. If the answer is no (and it probably is), your service is a commodity and that’s not good. We’ve all heard it before…if you want your business to be successful, you have to differentiate your service from your competitors. We all tend to talk ourselves into thinking that our services are better than our competitors. We think we have more experience than their competitors, that we are more knowledgeable about our industry, that we have more integrity (how do you quantify integrity) or that we are simply more likable. According to the Merriam-Webster Dictionary, a Commodity is: a good or service whose wide availability typically leads to smaller profit margins and diminishes the importance of factors (such as brand name) other than price. In reality most property management and field service businesses (landscaping, janitorial, snow removal, HVAC, etc.) really do the same thing and the only difference is price. As a service provider who’s worked with property management companies for the past decade, I can tell you that competing on price is no fun. Furthermore, the annual cycle of bidding for work based on the lowest price is not a good business model if you want to grow your business over time. Price doesn’t differentiate your service from your competitors, it just makes your service a cheaper commodity. But how does a property management firm or service provider differentiate themselves from their competition? Just look at the way Uber has overtaken the cab business. There is nothing special about riding in an Uber…a car pulls up to your house, you get in and a stranger drives you to your destination. Sounds like a cab ride doesn’t it? The difference is Uber has a mobile app that lets you know how long before a car gets to you, how much the ride is going to cost ahead of time and lets you choose the size of car. The differentiating element between Uber and other cab services is really the technology around the service and not the actual service itself. Uber has taken the commodity business of a cab ride and turned it into a specialty service. Have you ordered a Domino’s pizza lately? Check out their mobile app, it tells you every step of the process. It tells you when your pizza is being made, when it is in the oven and when it leaves the store for your home. The technology doesn’t make the pizza any better but it make ordering from Domino’s a better customer experience. If you really want to stand out in your field you have to stop being a commodity. We now live in a world where every business, especially service businesses, must differentiate themselves with technology. Virtually every business today can break out of the commodity business through the use of technology. How are you using technology to customize your services in a way that elevates your game above your competitors? If you are not offering something special that your customers would have to give up if they were to switch to a different service provider, then get ready for tough time in the years ahead because your competitors will figure it out and you’ll get left behind. So, you’re sitting at your desk on a fine summer day enjoying your coffee when you get a package delivered to you. You open the package and inside is a complaint letter from the Law Offices of “We’ve Got You Now”. The letter states that due to the negligence of the property owner, property manager and the snow removal contractor, their client slipped and fell on a sidewalk last November. As a result of the fall, their client has medical expenses, lost wages and pain and suffering in the amount of $150,000. How local property management firms can compete and win against the national firms. If you are a small to medium sized property management firm you’ve probably run into the national firms coming into your territory and stealing your clients. If you’re business focuses on the multi-site commercial clients you’re feeling the heat even more. To minimize your risk of lawsuits, it is not enough to have a reliable snow removal crew that does a good job. You can have the crew perform the work to the letter of the law and the contract and you can still have a slip and fall suite brought against all parties involved with the property. The life of a property manager can be tough. You’re probably managing several properties that span a whole city, a state or even multiple states. This means that you can’t see all of your properties every day. In fact you’re probably lucky to see all of your properties once a month or less. You need work to get done on your properties but can’t be there every time the janitors or grounds crews show up. So you line up your vendors, explain the scope of work to them and trust that they’ll do everything their required to do. Then, it’s just a matter of time until you get a call from a tenant or the property owner. They’re not happy because the vendor you lined up missed something. The janitors didn’t clean the third floor bathroom or the grounds crew didn’t show up yet this week. Or worse yet, you get a very angry call from commercial tenant informing you that it is 9:00am and the snow removal crew never showed up this morning. They ask you why you’re not doing your job and want to know what it’s going take to get this right and “when exactly” will the snow removal crew be there. You apologize to the client and promise to make things right. When you contact your vendors this is what you hear; the janitor said that he did clean the third floor bathroom but there were some kids playing down the hall and they must have messed it up again, the grounds crew said they were running a day behind this week and will be there tomorrow and the snow removal crew said they were there this morning from 6:00am to 7:00am and that it was snowing hard and snow piled up again. Does this sound familiar? Do these things happen over and over again? In the last few years there have been many advances in mobile technology that can help solve some of the problems that plague property managers. Mobile applications can help solve these problems by helping the property manager stay more informed about what is happening on their properties. Mobile applications bring information to the property manager rather than leaving the property manager with the task of visiting properties or making calls to get the information they need. The ability for all parties involved to collaborate. Property managers should be able to “see” what the vendors are doing, vendors should be able to demonstrate their work to their property managers, and both property managers and vendor should be able to show the end customers that everyone is doing their job. There are many mobile applications available Apple’s App Store or on the Google Play Store that are geared towards property management and field services industries. They usually run on the iPhone or Android phones or both. Some mobile apps are optimized to run on tablets like the iPad or on the numerous variants of the Android tablets. Some mobile apps are self-contained applications that store all information on the mobile device itself while other mobile applications send data back to a central server or “cloud service”. Mobile systems range from the simple stand-alone mobile apps to highly sophisticated “Computerized Maintenance Management System” (CMMS). The very high end systems may give you more features than you’ll probably ever use but can also be prohibitively expensive for all but the largest organizations. The simplest systems may not provide the features needed to truly make a difference in the property managers work life. The key is to find something in between that works. Mobile applications for property managers can present some formidable challenges. Some apps are free or very low cost but most apps are sold on a “per-user” basis. That is, there is a monthly fee for each person that will be using the app. Monthly per-user fees often range from $30 to $100 per month per user. Under the per-user fee model, even a small property management firm with five employees who manages 10 field crews can expect to pay $450 to $1,500 per month. This doesn’t take into account any setup or installation costs. Most mobile apps require an “always-on” internet connection to function properly. If the remote crew is in an area of poor cell phone coverage they fail to work, causing frustration for both the field crews and property manager. The best mobile apps do not require an “always-on” connection and will store data locally and then upload the data when the internet connection is re-established. Sometimes it is not the cost of the system or the internet connection that presents the challenges. Sometimes the problems come from the crews in the field. The people who write the mobile applications are highly technical people and it’s likely that they’ve never actually worked with field crews and don’t understand the way they think. Field crews are very good at their job but more often than not they are not good with highly technical systems. The single most important consideration when implementing a mobile system is whether the app is easy and intuitive for the end user. If the technology you implement is too complicated for the end users, they simply will not be able to effectively use it and your efforts will fail. Does a prospective solution include most, if not all, of the above listed features? How many users will need to have access to the mobile technology? Make sure you count everyone and decide whether you will give access to your customers in addition to your field crews. What kind of mobile devices do your users already have? You don’t want to be stuck having to buy new phones or tablets for all of your users. Is the prospective system simple and intuitive enough for your people to actually use? Are the field crews ever in an area with poor internet coverage? If so, the application should work in offline mode for the times when an internet connection is not available. Is English is a second language for your users? If so, find a system that is multi-lingual and works in the native language of your users. Do you perform invoicing, billing, inventory control, payment processing from the field or is that a back office job. For the property manager, these are usually back office functions that you can leave out of any mobile technology. The right mobile technology should make the property manager’s job a lot easier and should make the end customer a lot happier. When looking for a mobile system, look for features that will make you as a property manager more efficient. You should not invest in a system that gives you the feeling that you are just going to have one more thing to manage. You should get the feeling that the system works for you and not the other way round. It should be a system that will lighten your work load by reducing trips to your properties, reduce frantic phone calls from customers, reduce calls to vendors, reduce paperwork, record keeping, etc. When you find the right system your life will become a lot easier because the system will make you more efficient. Some salespeople will give you the standard sales line that their product provides X percent “Return On Investment” (ROI) and that by implementing their system you’ll instantly make X percent more money. Don’t implement a mobile system based on vendor claims of ROI. Evaluate a system based on how much more efficient it will make you as a property manager. Then look what that system costs to get that efficiency and make your decision. Seek “return on efficiency” first and the Return on Investment will follow. FieldVision by DTSI is a mobile application designed for property managers and field service providers to solve the problems that each face every day in the course of their work. Crews that go out into the field to perform work need a means of tracking that work and also proving to the client that the work has been done satisfactorily. Property owners and managers need a way to track and verify that the field service crews are performing the work required and that the work is done well. One of the biggest problems for field service companies and their clients (property managers) is the lack of visibility regarding the status of work to be performed at remote locations. Companies providing the services do not know exactly when services are to be completed and property managers are not notified when services are completed. This is particularly true of field services operations (snow removal, landscaping, facilities maintenance, etc.) whereby the customer or property manager is not at the property at the time of service. Because of this lack of communication, property managers and field supervisors often need to resort to phone calls to ask whether a property has been serviced or not and when the next service is scheduled. 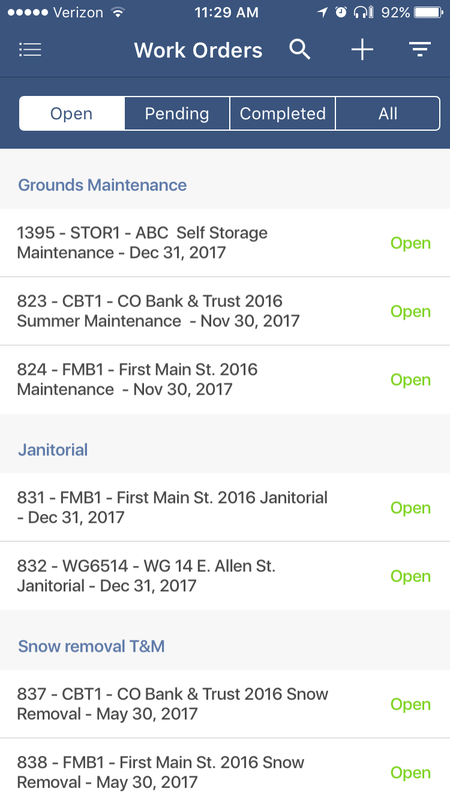 FieldVision solves these problems by giving field crews the ability to update their work status and to have that information made instantly available to their supervisors, customers and property managers. This capability provides a significant strategic and economic value to both service provider and property managers. Both property managers and field service companies have become inundated with unorganized collections of individual photos which are often sent back and forth via text messages and email. Property managers and service providers sometimes have so many photos of properties that the photos that they may want to find on a particular day have become lost among the thousands of photos on their devices and computers. FieldVision solves the problem of organizing photos by associated each photo with a property or work order. Track work at one property or thousands of properties.